Home to various natural wonders, there’s a reason Palawan is one of the most sought-after destinations in the archipelago. Whether you’re thrilled to be a first-time visitor or are keen for a return trip, here’s a rundown of its must-visit spots. Nacpan is one of the best spots to visit in the region if you just want to chill on white sand and absorb the beauty of the greenery that surrounds it. Located 30 minutes away from the mainland of Araceli, Cambari Island’s most popular attraction are the beautiful rock formations that would look SO perfect for the ‘gram. For those hoping for a quiet getaway, Huma Island’s little villas will let you enjoy a private one-on-one with the pristine waters that surround them. Big Lagoon is one of the many pristine lagoons in Palawan. Kayak through the crystal-clear waters of the lagoon and snap a few Insta-worthy photos while you’re at it. Another beloved spot in Coron are the Twin Lagoons. Snorkeling is the best way to appreciate its underwater beauty, but the view from above isn’t so bad. While Palawan is known for its immaculate beaches, it is also home to the Maquinit Hot Springs. It’s said to be one of the few saltwater springs in the world, which makes it a must-visit if you’re ever in the region. 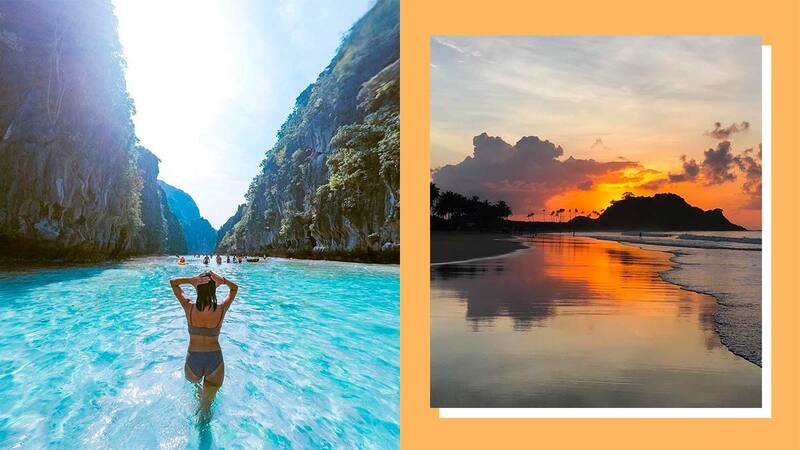 Real talk: The little village of Port Barton proves to be an equal contender against the more popular beach destinations in Palawan like El Nido and Puerto Princesa. Possibly the most popular attraction in Palawan, the underground river is an experience you wouldn’t want to pass up. Fair warning: It’s not for the faint of heart. Inside the pitch-black cave is an assembly of beautifully formed stalactites and stalagmites. Its eerie allure will leave you decidedly fascinated AND terrified by Nature’s wonders. The glassy surface of Kayangan Lake makes it easy to witness the beauty that’s hidden under. Go snorkeling to see the underwater rock formations up close. This strip of white sand surrounded by crisp blue waters is a daydream of a destination. Live the ultimate beach life by lazing around Corong Corong’s white sand. If you’re willing (and able!) to shell out the moolah, Amanpulo is a luxurious hideaway you’ll want to tick off your travel bucket list. Aside from its glorious beach strip, Black Island’s enchanting caves are a tourist must-see. Comiran Island’s pink shores set it apart from Palawan’s roster of world-class beaches. If you’re taking a tour of the Coron islands, you’re bound to make a stop at the majestic Banul Beach. Thrill-seekers will, no doubt, be pleased by the challenge of climbing up Taraw Cliff. The hike may be arduous AF, but as soon as you reach its peak, the stunning view of the island will greet you for a job well done. Onuk Island is just one of the many quintessential must-sees in Balabac. If you’re hoping for a good diving experience, Barracuda Lake is the body of water you’re looking for. In the daytime, the view from the Iwahig Firefly Watching deck presents a calming view of the river. At night, it offers an overwhelming panorama of countless glowing fireflies.